French into English and English into French translation services from almiaad.co.uk, for a more accurate, professional and localised translation. 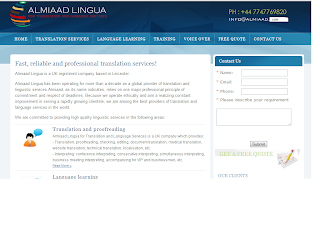 English to French translation services have been an important section within Almiaad Lingua since its inauguration more than a decade ago. The volume of work received and the scope of clientele have both witnessed a remarkable growth. This necessitated reorganizing the company structure to include a new team for our French translation services. Since the UK service section has been in constant improvement and the need for French professional translation have been growing steadily, the localisation of the services to meet the requirements of Ireland, Scotland, England and Wales was a necessity. For the purpose of providing more tailored customer services, the new website for the new UK-based team has was launched this year, providing professional, accurate and localised quality service. The idea was that a very basic website with a few links, less content and in a straightforward style will be more helpful than a sophisticated content and structure. Beyond all, a client will be looking for basic information and contact form to negotiate an offer. The new website is also destined to potential clients looking for UK - based translation service providers and individuals / corporates based in countries from the same region. Our analysis of Google Analytics results has revealed the great potential in Scandinavian markets, for example. There is secret in saying that the interest of Swedish and Danish translation service seekers shows an interest in UK translation service providers. Also, their interest in English into French translation has been as high as their important need for French into English localisation. French into English is equally important for clients from France, where our new almiaad.fr website will be launched by our local team. Not only French clients from France are require the translation of their documents into English, but also people from the USA, Canada, and corporates from different parts of Europe, the Middle East and other parts of the world. Although Canadian French is a bit different as a separate variety of French, our UK local team deals with Canadian French translations coming from different locations. This indicates that the language classification of teams in different markets we have adopted is not as sharp as we might think. The team based in Canada very often receives requests for English into Arabic translations, while the UK based team usually deals with English French translations. However, our rationale was that the autonomous local teams with their local websites facilitate the work of professional localisation projects. French into English and English into French translation services are in higher demand, notwithstanding the remarkable recession in the translation profession. Hence, our efforts to improve the quality of our accurate and professional French into English and English into French translations are not limited to the dedication of local teams. We have planned to recruit more specialised professional translators whose services cover French English translations as native speakers of the target language and very fluent or native like users of the original one. Almiaad Lingua has translated more than 2 million words in the current year within English into French pair originating from 65 clients including, individuals, corporates and non-government organisations. 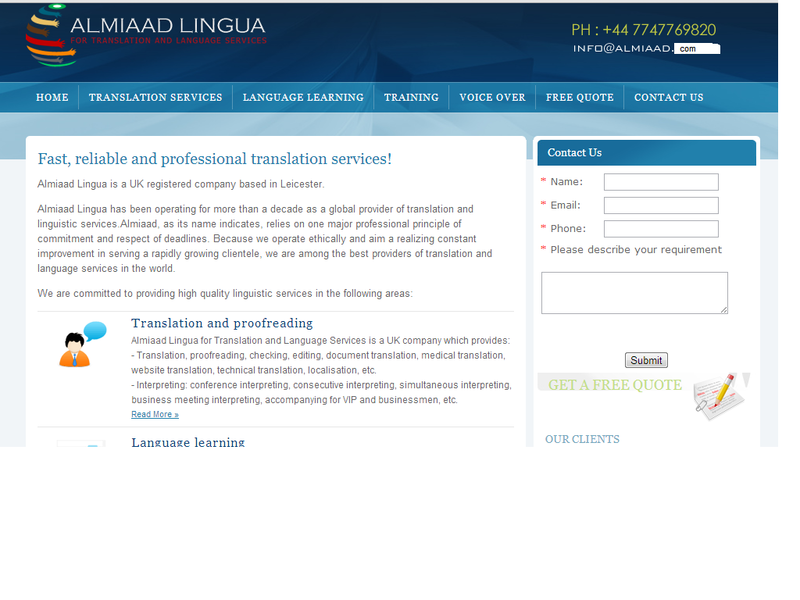 For all your professional translation needs, Almiaad Lingua has teams around the globe to serve you. Does this new website change the staff and prices? The price range is very reasonable and this is proven by clients' comments. What makes our services unique is our commitment to quality and professionalism. Professional translation is the sincere and accurate transformation of a message from one language to another. no? yes yes guys and why not? The only way to ensure your site has professionally-written content is to hire an expert. If you are dealing with an international site, that means working with a qualified translation service. Thank you for the comment. Kindly follow us and join this site.